What makes a good poetry event? This is merely a personal theory: when you recall a good poetry happening, your ability to convey factual information about it has to fail at some point. That is, you should be able to say: “these were the poems”, “these were the questions”, “these were the answers” and so on, but, if it was good poetry, surely at some point you slipped into more abstract realms, you lost track of time, you experienced something peculiar, ultimately––something poetic. About these latter things it is nearly impossible to provide facts; they are like moving sands. I have recently had the chance to test this theory again. 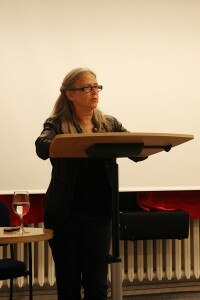 The event, which took place at ECLA of Bard on the 6th of September, was a reading and discussion with Susan H. Gillespie, whose translation of a selection from Paul Celan’s works has just been published with Station Hill Press, Inc. (Barrytown, NY) in a bilingual edition entitled Corona: Selected Poems of Paul Celan. An experienced translator of German philosophy and literature, Gillespie is also a Founding Director of the Institute for International Liberal Education of Bard College. In his opening speech, ECLA of Bard Rector and Provost Thomas Rommel commented on the fortunate duplicity of Gillespie’s career, pointing out that she is a true professional in both translation and international education. Rommel also provided suggestive examples to illustrate Gillespie’s versatility. On the one hand, he recalled an event at the American Academy in Berlin, where Gillespie made a decisive comment in a discussion on Theodor Adorno, only later revealing that she is the translator herself. On the other, he spoke about a document which attests Gillespie’s first visit to ECLA of Bard (then, ECLA) in 2004. ECLA’s merger with Bard, Rommel suggested, was made possible by Susan Gillespie. These are the facts. Now, the other side, the one that does not quite obey facts. At some point during Rommel’s speech someone accidentally switched the lights off. Rommel jokingly adapted his talk, mid-sentence, and invoked a “bridge between darkness and light”. It was meant to remain an accident, however amusing. Yet, as it would soon become clear, and as if the speaker had opened some kind of Pandora’s box, things started revolving around the motif of darkness and light. And, in general, things started revolving; nothing was quite linear anymore. By the next step we were already on moving sands. That evening, poetry began with a light switch. When the lights went off again, Celan’s picture, projected on the wall, was the only source of light. He was gazing somewhere above our heads, to the left. Soon a recording of his own reading of the poem “Corona” started. The air was thick with perceptions as the poet pronounced “wir sagen uns Dunkles” (“we speak of dark things”). Certainly it was synesthesia that I experienced, but it was not as if all sense-perceptions had merged into one overwhelming feeling. Rather, I could clearly understand each of them separately, as in an equation: the low dark room + Celan’s luminous figure + his intransigent voice + X (a sound which I could not identify; it was either from the planes flying above Pankow or some wild ventilation system above). Lights on, Gillespie spoke about Celan’s tumultuous life (1920-1970), the ruptured historical background of Bukovina, his native region, the loss of his parents in the Holocaust, the exile to Paris and the complicated relation with Germany, the country of his language, and, ultimately, his suicide in the Seine. Gillespie emphasized the fact that Celan himself was a prolific translator and could not conceive of his work as isolated from translation. Some of the poems, Gillespie insisted, are precisely about the nature of translation (“Es ist alles anders”/ “Everything is otherwise”). She then promised to alternate readings of her rendition of the poems with a discussion on the job of the translator. Indeed, things proceeded in this ebb-tide rhythm, each poem followed by a short, vivid dialogue. And thus, gradually, poem after poem, one could understand or else rediscover something about Celan’s poetic personality. The motif of light and darkness did not leave us––on the contrary, it obsessively came back, with poems such as “Von Dunkel zu Dunkel”/ “From Dark to Dark”, the motif of Corona (in its literal meaning, an aura around the sun), Celan’s fascination with “back-lit things” etc. And thus, gradually, question after question, one could also understand something about Gillespie’s personality as a translator. First of all, that she believes in the translatability of poetry itself (a matter of skepticism for some) and thinks that the only untranslatable poetry is really well rhymed poetry. At some point, when asked about the legitimacy of translation as such, she said that she feels “absolutely good and positive about it”. However, in order for the process to succeed, one has to really “get a hold of” the texts, “give oneself over”, “speak them in one’s own language”, have an almost physical sensation of appropriation. This, the translator admitted, is for her “a semi-conscious affair” and only later––a matter of looking up words in the Thesaurus. Even though Gillespie quoted Celan on his thought that a poem is like a handshake, i.e. an agreement between writer and reader, she boldly confessed that she never thinks about the reader in the first place, her own ear being “the test”. Her aim in translating poetry is maximum ambiguity, she declared. The way in which Gillespie argued for some of the specific word choices made a number of spectators opine that, for her, translation is mainly a process of interpretation. For instance, about the poem that Celan wrote for and sent to Heidegger (“Todtnauberg”) after their meeting in Freiburg in 1966, Gillespie said she holds a “strong opinion”. Namely, she thinks that the philosopher’s rejection of Celan decisively contributed to the latter’s psychological turmoil in his last years. This interpretation is related, one could speculate, to some of the linguistic choices of the translator, and to the overall shape of the translation. Ultimately, Gillespie accepted the hypothesis of translation as interpretation, but claimed that a specific interpretation comes to her only after the work is done. In answering often provocative questions, Gillespie was no less decisive and precise. When someone asked about Celan’s supposed avoidance of words of Latin origin and how that impacts her translation, she calmly answered: “It’s a prejudice”. By the end of this not-quite-linear journey into poetry and its counterpart in translation, I arrived at the conclusion that Gillespie translates a poem in the same way in which a poet writes one: passionately, idiosyncratically, and with a kind of unbending belief in particular, minute choices that seem to determine everything. So, there is poetry and there is poetry of translation. There are poet-translators and translator-poets. As Gillespie put it: there is no boundary between the poem and the translation. All is moving sand, I add.